I am definitely not ready to switch into chilly weather mode, but Zoya’s release of their fall collection is as gorgeous as polish gets. There are two collections with six polishes each; Designer (cream polish) and Diva (metallic polish) both collections are inspired by the runway –New York Fashion Week 2012 to be exact. The Designer part of the collection is my absolute favorite, and it will even make you feel like you belong on the runaway (for a moment anyway) since it includes two designers’ custom colors. You can bet all six of these colors will be spending equal time on my fingers. What do you think of this collection/ what is your favorite color? 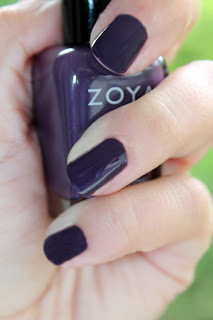 Monica is a gorgeous vampy cool-toned mulberry purple. Evvie is a smokey evergreen custom made for Peter Som to complement the jewel toned and off-white colors of his collection. 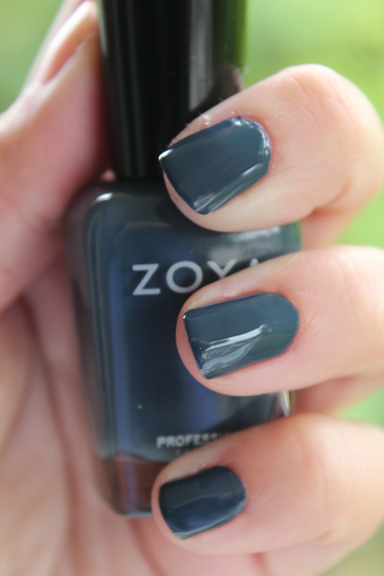 Natty is a dusty navy blue. 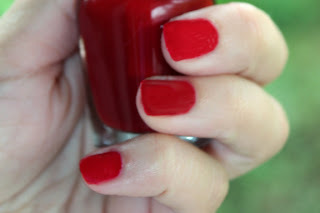 Rekha is a classic cool-toned bright red. It is a bit transparent, but would be a great polish for layering. It was also a custom color created for Bibhu Mohapatra's runway show. Toni is a dusty maroon hue, and it is clear that the perfect combination of red and blue was used to make this color. Noot is a murky charcoal green with a touch of gray. 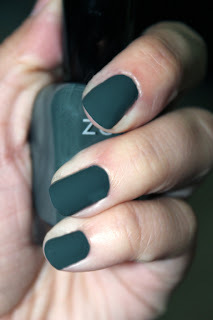 Inside this color didn't do much for me, but outside it quickly became a must have. I love every single one of those colors! these colors are much more my speed. I always tend to gravitate towards the darker shades. Loving Natty and Toni. So ready for Fall! I seen the fall colors when I was in the salon last weekend....gorgeous! I love the dark shades of green. You are the queen of nail polish! I haven't used Zoya before. How does it go on? How is it compared to OPI and Essie? These nail colors are fabulous. I love the deeper hues. Nati and Tony are my faves - gorgeous!! I love Zoya polishes! I normally wouldn't even consider a greyish nail polish, but I am really liking the Natty color! It's gorgeous! lose the purple and the noot color! i need more nail polish! I love Zoya polish! I will definitely be using Monica and Natty on my nails this fall! I love Natty - so pretty!